I was saddened to hear that Frank Broyles died today. 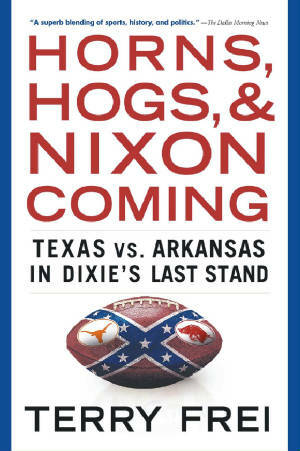 I interviewed the long-time University of Arkansas football coach and athletic director for my Sporting News retrospective story at the 25th anniversary of the famous 1969 Texas-Arkansas game, and then again when I circled back for more research for the book Horns, Hogs and Nixon Coming in 2002. He was cooperative and cordial both times. That picture, taken in the pre-foolproof cell phone camera age, shows I'm not a natural photographer. 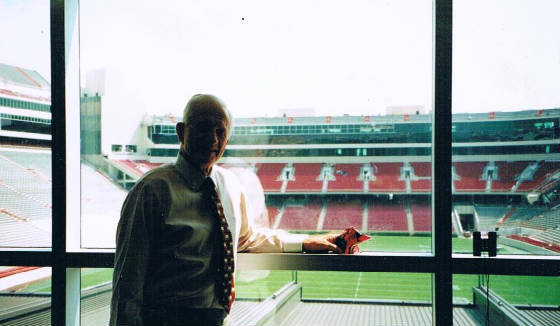 We had just finished talking in his office, and Broyles was about to give me a tour of the Razorback Stadium renovation project going on at the time. Although he was in his mid-70s, I had a hard time keeping up with him. In both rounds of interviews, he claimed (and I believed him) that he hadn't ever watched film or the recorded ABC broadcast of the game, and that led to some gaps in his remembrances. The loss was that painful. After the book came out, he told Arkansas writers that -- nothing personal against me -- he wouldn't read it, either. Part of the connect-the-dots and revelatory material in the book were interviews with Darrell Brown, who told me about attempting to integrate the Arkansas program when he walked on and played for the freshman team in 1965, and with Hiram McBeth. a non-scholarship reserve defensive back in 1969 who didn't suit up for varsity games. As a law student and resident advisor, Brown was wounded in the leg in a drive-by shooting on the night before the Texas-Arkansas game, and McBeth was among the students in the stands prepared to storm the field and lay down if the Arkansas band played the song "Dixie" after months of debate and controversy led to band director Richard Worthington promising to abide by a Student Senate vote to ban the song. As a defense attorney in Jim Guy Tucker's Whitewater trial, Brown eventually questioned Bill Clinton on video in the White House. When I got to the "Big Shootout" itself, I discussed the controversial play-calling and strategic decisions the drew Broyles and his staff considerable criticism. Broyles was open to talking about it all, though he at times seemed to be in a bit of denial. I also was disappointed when he withdrew full official athletic department support in 2004 for a joint reunion of the two '69 teams held in Fayetteville in conjunction with a rare Razorbacks-Longhorns rematch. I was the neutral keynote speaker. The reunion went on -- without Broyles in attendance -- but the teams weren't introduced on the field at halftime as Broyles caved in to those who argued that Arkansas shouldn't honor the opposing players from one of the most crushing defeats in the school's athletic history. The decision left many of Broyles' ex-players feeling betrayed, and the Texas players were angered. Here, the two teams could get together to break bread and commemorate being part of one of the most notable games in college football history, but they wouldn't be acknowleged on the field as their schools played again thirty-five years later. But Coach Broyles was a giant in Arkansas sports, both as a coach and administrator, and in college football. I salute him. The talk of a 1969 schedule change started on the day Frank Broyles played golf in Little Rock and attended a Razorback Club gathering in little Lonoke, twenty miles farther east. The routine was part of the job for any college football coach: Travel the state, usually in a plush dealer-provided car, often with coffee cup in hand, and make speeches, mingle, or play golf with groups large and small. Yet one reason Frank Broyles loved coaching at the University of Arkansas was that every gathering around the state could turn into a pep rally. He could scan any sort of group—service organizations, lodges, high school awards banquets—and know these people were for the Razorbacks! Unlike his coaching contemporaries in the Southwest Conference and most of them around the country, Broyles didn’t need to worry about divided loyalties in his state. He never witnessed half the men standing for the fight song of State U, with the others glowering in their seats, before the roles were reversed for the next song. The drawback to the coach’s goodwill tours in the state involved geography. Tucked in the northwest corner of the state, Fayetteville is closer to Tulsa, Oklahoma (117 miles), than to Little Rock (192 miles), where so many of the power brokers lived. The Razorbacks played at least three “home” games a season in Little Rock’s War Memorial Stadium. In March 1969, when Broyles was visiting Little Rock and Lonoke, he was forty-four years old and a veteran of eleven seasons as the Razorbacks’ head coach. He already had won a national championship, in 1964, with a team that shut out its last five regular-season opponents and included heady crewcut hustlers Jimmy Johnson and Jerry Jones. Alabama was No. 1 in the final Associated Press and United Press International polls, and the Razorbacks were No. 2. Neither wire service conducted a poll after the bowl games. In the Orange Bowl, a hobbled Joe Namath came off the bench to lead an Alabama comeback that came up short and the Crimson Tide lost 21–17 to, of all teams, the Texas Longhorns. The Football Writers Association had a poll then, too, and it took a vote after the bowl games. Arkansas, which beat Nebraska 10–7 in the Cotton Bowl, climbed to No. 1, and that became the accepted and eminently sensible national view, both at the time and in record books. Especially after that national title the Razorbacks’ lanky head coach with the Georgia drawl was as renowned in the state as Arkansas’s high-profile politicians. He was as big as or bigger than Senator J. William Fulbright, the former Rhodes Scholar and Razorbacks football player from 1921 to 1924 who also served as the University of Arkansas’s president from 1939 to 1941 before entering politics. Broyles was as well-known as Representative Wilbur Mills, feared and courted on Capitol Hill and around the country because he chaired the House Ways and Means Committee. If Governor Winthrop Rockefeller, Nelson’s brother, had walked into a room with Broyles, the football coach likely would have drawn more attention. To his players, Broyles was a Christian southern gentleman above it all, sometimes literally, watching from a tower while the sun set behind him and looking like an apparition. Some of the Razorbacks considered him their Billy Graham, relocated from the pulpit to the sideline and tower. When he addressed his boys, he could have them crying one moment, ready to run through a wall the next. He demanded that his players play tough but clean football, and there was just something about him that made the Razorbacks want to emulate his dignity, at least when they were around him. Yet this always would be an arm’s-length relationship, not a full-scale embrace. Broyles wasn’t intimidating as much as he was detached, and it was the sort of distance that couldn’t be eliminated even when he came down from the tower. Sometimes, it seemed that the southern gentleman was a cold man, incapable of becoming closer to his players. But a few Razorbacks came to believe he held himself back not only to maintain the image of the detached, all-powerful coach with the final authority, but also because Broyles was vulnerable and could be troubled when he had to make tough decisions about players—especially if he had allowed himself to grow close to them. So, his detachment might have been more of a defense mechanism than a calculated coaching strategy. But it all meant that when Broyles did try to be more fuzzy and fatherly as games approached, it made some Razorbacks uneasy because it seemed such a change from the coach’s standard operating procedure. The Razorbacks understood that Broyles was the boss who hired sharp assistants and let them do their jobs—which included the “dirty work” of running off-season conditioning programs, enforcing boot-camp punishment when the boys got carried away, and even pulling strings here and there, including with the National Guard. The head coach as chief executive was not a unique concept, but Broyles already was known to have a brilliance for luring and nurturing bright assistant coaches who could live up to his trust. By the late 1960s, several former Broyles assistants had moved on to be head coaches—Hayden Fry (Southern Methodist), Jim Mackenzie (Oklahoma), Doug Dickey (Tennessee), and Johnny Majors (Iowa State). Barry Switzer, a Razorbacks co-captain under Broyles in 1959, was on the Broyles staff from 1964 to 1966, then moved to Oklahoma as an assistant in 1966. In 1969, the Razorback players knew all about the upward mobility of Broyles assistants, too, and they assumed they were working with ascending stars in the coaching profession—including offensive backfield coach Don Breaux, twenty-nine; receivers coach Richard Williamson, twenty-eight; and defensive line coach Charley Coffey, the graybeard at thirty-five. Those were the official designations: In reality, Breaux was the head offensive coach and Coffey ran the defense—the title “coordinator” wasn’t yet in vogue. Broyles was above it all, and not only when he was on that tower. Beyond that, as with all head coaches, the players’ feelings toward Broyles were dramatically affected by factors such as playing time and individual success. Still, the respect for Broyles was impressively pervasive among the veteran Razorbacks—and has remained strong over the years. Regardless, most of the Razorbacks knew little of Frank Broyles’s background. He was “Coach Broyles,” and they didn’t really need to know much else. The Arkansas coach’s grandfather, R.A., started a string of small grocery stores in the Atlanta area, and Frank’s father, O.T., inherited three of them. Frank was born December 26, 1924, the youngest of five children in the family, which lived in Decatur, adjacent to Atlanta. O.T.’s business weakness was his benevolent extension of credit, and his inability, or unwillingness, to collect. So the stores went under during the Great Depression, and when Frank was about ten, the family lost its house when O.T. couldn’t pay the taxes. The clan moved into a rental home formerly owned by R. A. Broyles, and O.T. got back on his feet selling cars. All along, as Broyles wrote in his 1979 autobiography, Hog Wild, Frank immersed himself in sports, memorizing the lineups of all sixteen major-league baseball teams and reading the latest news from the bushes—even the Class D East Texas League—in the back of The Sporting News. The gangly teenager became a great athlete at Boys’ High in Decatur, and football was his “third” sport, behind baseball and basketball. He got scholarship offers from Georgia, Clemson, and Duke, but then jumped at the chance to stay home and go to Georgia Tech. He starred for the Yellow Jackets in both basketball and football during the World War II years, enlisting in the Naval Reserves in December 1942—three days before his eighteenth birthday—and staying in school until March 1945. That delay raised some eyebrows among other World War II veterans going over his biography later, but it was neither his fault nor his anticipation that the Navy was the final branch of the service to summon its reserves off the Georgia Tech campus. (College students who based their enlistment choices on predictions about which services would call up their reserves last often discovered that the “scuttlebutt” was off-target.) Broyles was called up, took officer training at Providence, Rhode Island, married his longtime Decatur girlfriend, Barbara Day, and was at Pearl Harbor when the war ended in the Pacific. Broyles played one more season in both football and basketball with the Yellow Jackets, the former as a quarterback under his mentor, Bobby Dodd. After graduating, he considered an offer from the Chicago Bears, but married players in those days frequently knew it was potential economic suicide for all but the stars to go to the NFL and delay an entry in the “real” job market. Broyles was an assistant coach at Baylor and then Florida before returning to Tech to serve as a Dodd assistant from 1951 to 1956. He applied for the Arkansas head-coaching job in 1955, but Jack Mitchell was hired instead. Broyles’s chance came when he was named to succeed a legendary head coach, Don Faurot, at Missouri in 1957. Broyles also was saddled with an idealistic and naïve recruiting approach—the “Missouri Plan,” which dictated that he could offer scholarships only to high school players from the state. If you wanted the job, you said during the interviews that you could live with the “Missouri Plan,” and you maybe even believed it when you said it. But when you tried to work with it in the tough Big Seven Conference, you realized it was a great way to quickly go from being touted as a bright, young coaching prospect to being a fired, failed head coach. He recruited Missouri’s first black scholarship players, halfbacks Norris Stevenson from St. Louis and Mel West from Jefferson City, then coached the Tigers to a 5–4–1 record in 1957. He also assumed—correctly, as it turned out—the Missouri Plan soon would be dropped. But when Mitchell left Arkansas to go to Kansas, the Razorbacks hired Broyles away from Missouri. Athletic director John Barnhill, a former Razorbacks football coach himself, hoped Broyles would be both successful and around for longer than his two immediate predecessors, Bowden Wyatt and Mitchell, who had stayed a combined five seasons. When Broyles arrived, the Razorbacks had a small stadium in Fayetteville and so-so locker-room, training, and practice facilities. They were battling the perception that theirs was a “poor” school in a “poor” state, competing against the seven Texas-based Southwest Conference universities. But Barnhill—"Barnie”—wasn’t silly enough to tell his coach he only could recruit in-state prospects. So the Razorbacks’ rosters during the Broyles era routinely included players from Oklahoma, Texas, and Louisiana, and occasionally from other states as well. By 1969, Broyles hadn’t only quieted fears that his goal was to return to Georgia Tech as head coach, that he was another mercenary who would use the Razorback job as a stepping-stone; he also had turned the Arkansas job into his empire. Barnhill was easing toward retirement, and he had turned over the decisions about most football program issues to Broyles, including scheduling. Broyles says that when he called his wife, Barbara, that day in March, Barbara told him that ABC Sports executive Roone Arledge had phoned. Frank was supposed to call him ASAP.